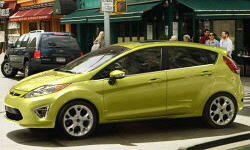 Why the 2013 Ford Fiesta? Good for the tight pocketbook. Narrow car with narrow seats. If you are a taller/bigger person, expect that the seats will feel like doll furniture after an hour. Not bad for an economy car. Good tires lead to less road noise, engine is not buzzy. Some wind noise. Not one problem in 1 year and 10,000 miles. Just runs.